So the whole reason I haven't been out riding around on my Honda 250 is because the starter clutch has been broken all this time. I took it apart when I was younger but there is no way to repair the unit and finding a new one is not easy. 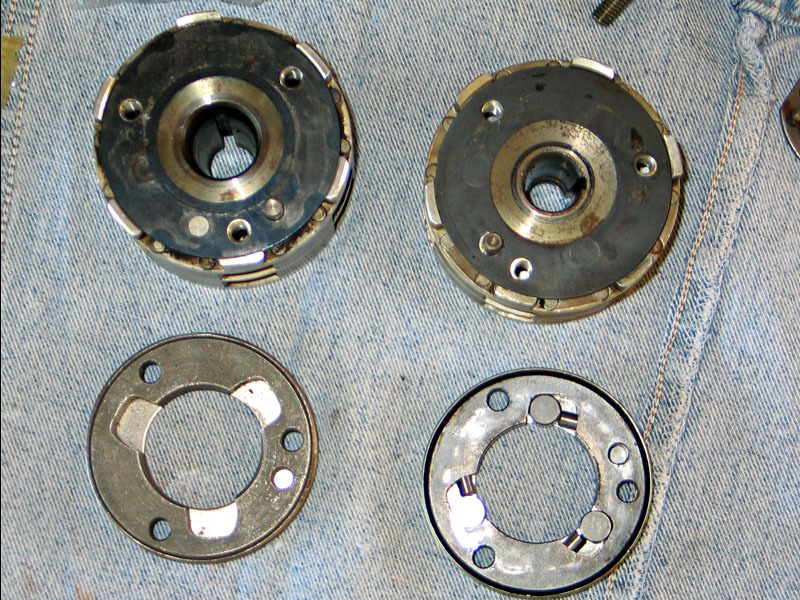 I have a spare Benly 150 engine so I took it apart to see if I could use the starter clutch from it. I took off the magneto and the starter clutch looks like new BUT the holes are in a different arrangement around the clutch unit, bummer. Here are some pics comparing the two. As you can see there is a good crack from one of the roller cavities. The metal case surrounding the part is destroyed as well. A couple springs went flying and the pins that push the rollers are also damaged. 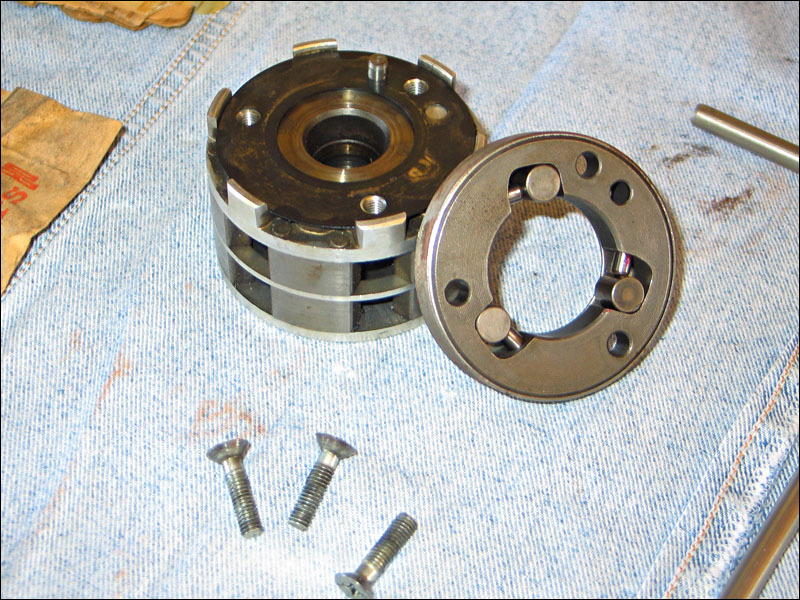 Here is a shot of the Honda Benly 150 starter clutch. 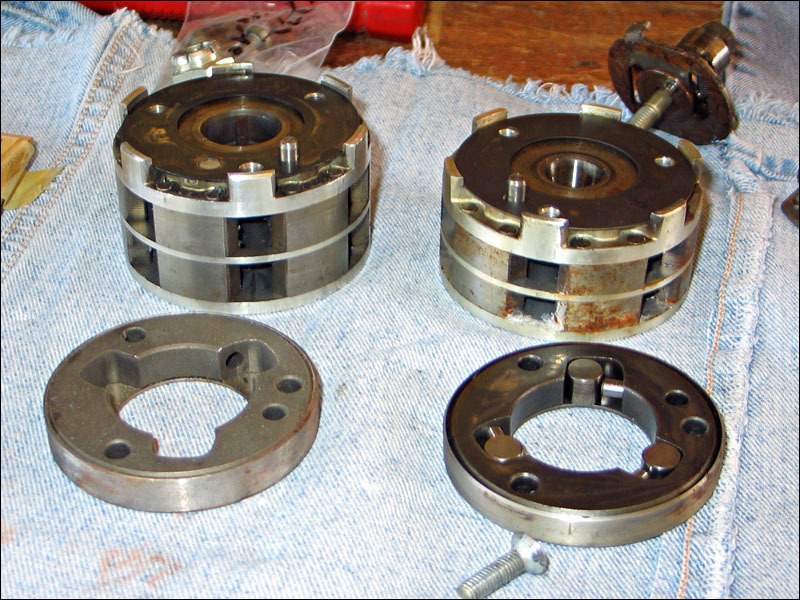 It looks the same but the holes are machined slightly off from the arrangement on the 250 unit. 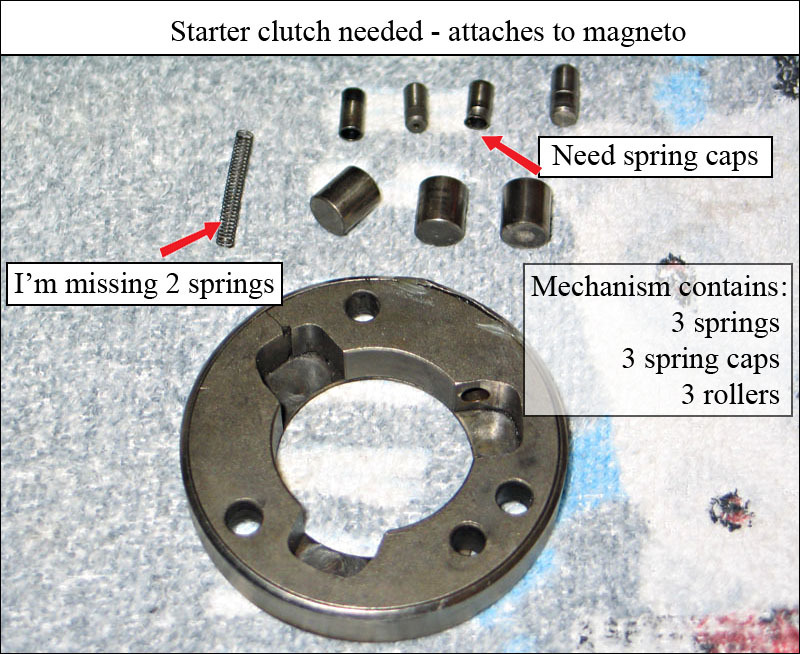 Here is the starter clutch on the magneto. 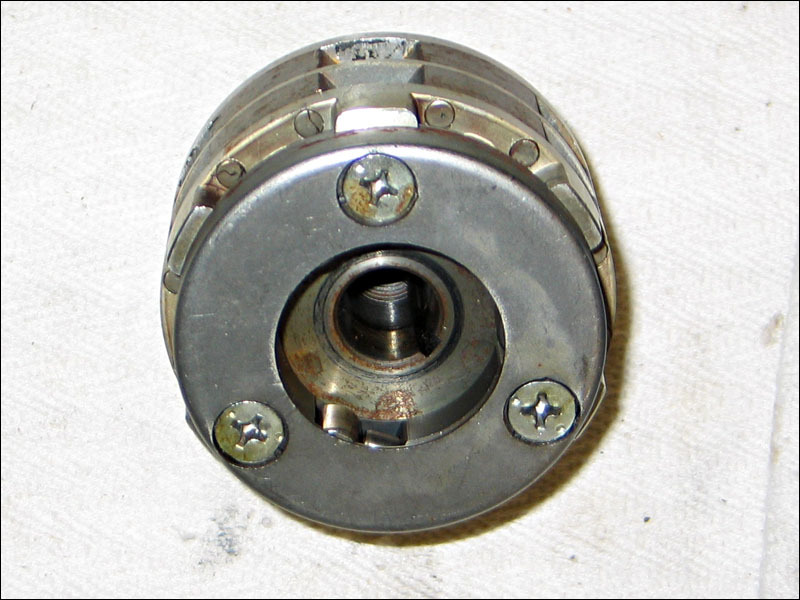 The face of the starter clutch faces inward when it is assembled onto the crankshaft. 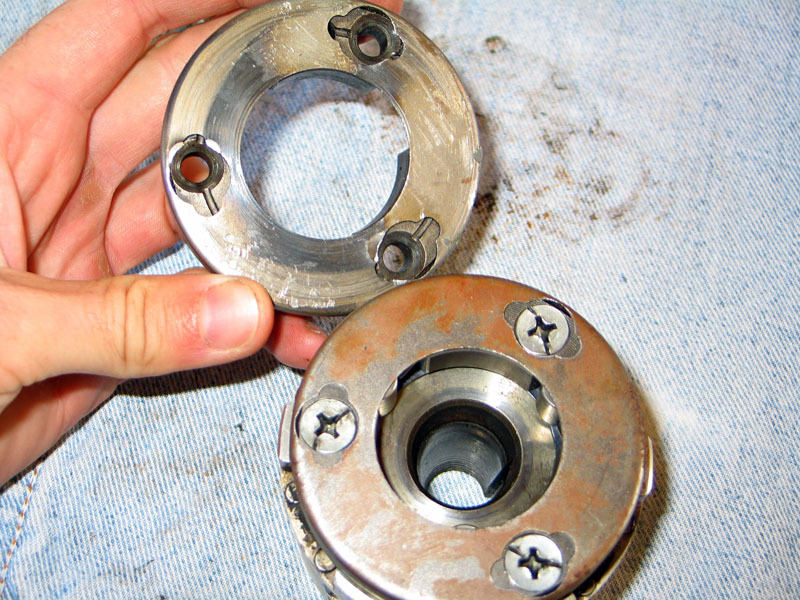 I do believe that this starter clutch has the same hole arrangement as the Benly 150. 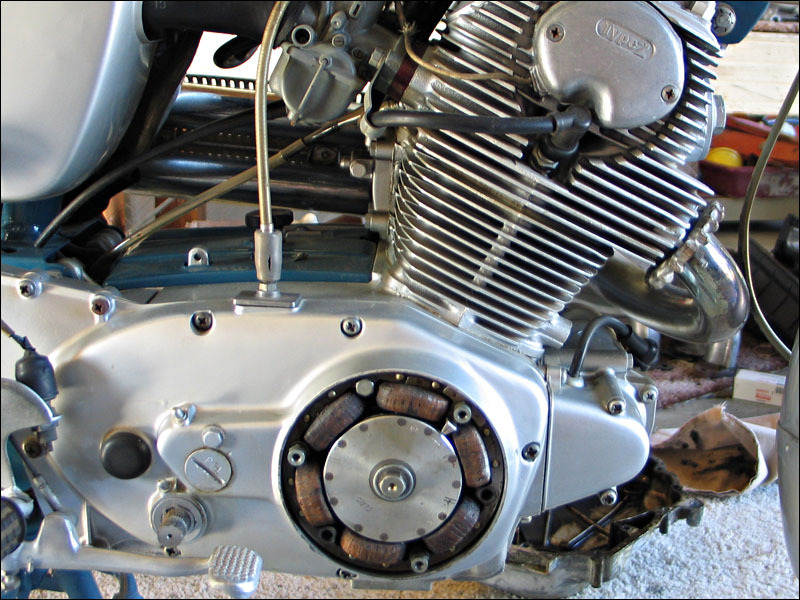 A seller on Ebay is selling one that he claims fits both the CMX250 and the CB250 engines but his picture shows the exact same bolt pattern as my 150. Hmmm what a headache. Ive thought about drilling mine out to fit the 250 but that type of material cracks very easily when heat and vibration is applied to it and I don't want to ruin it as I would like to keep it in case I need it for one of the other bikes. Here is how worn out the old starter parts were. The caps wore right through from the rollers. You can tell that the previous owner of this bike used the hell out of the starter! It wasn't me! I probably started this thing maybe 15 times at the very most when I was in high school. I actually used some spring caps (that push the rollers) from the spare Honda 150 I have. They were exactly the same and from the picture above you can see that I needed a new set! 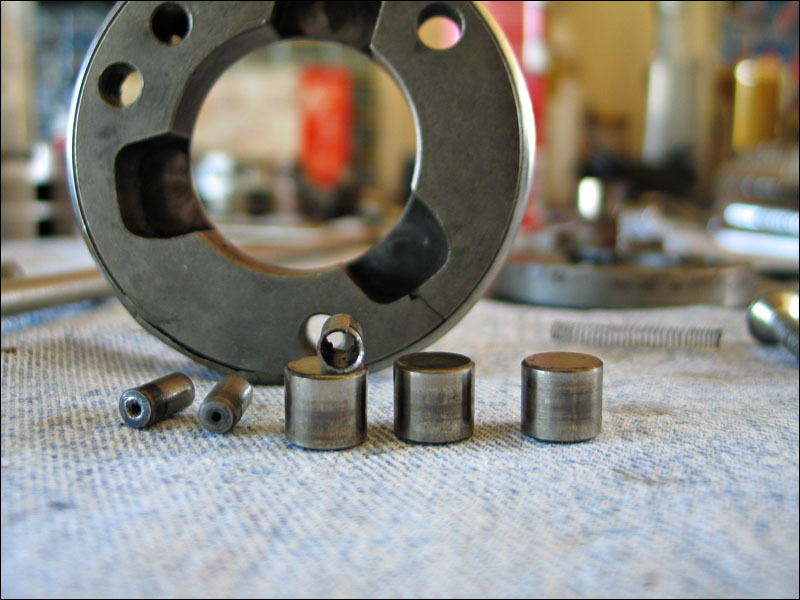 I highly recommend buying a broke ol Honda parts bike to rob engine parts from and spare nuts and bolts. A ton of the old Honda 60 bikes use the same parts here and there. 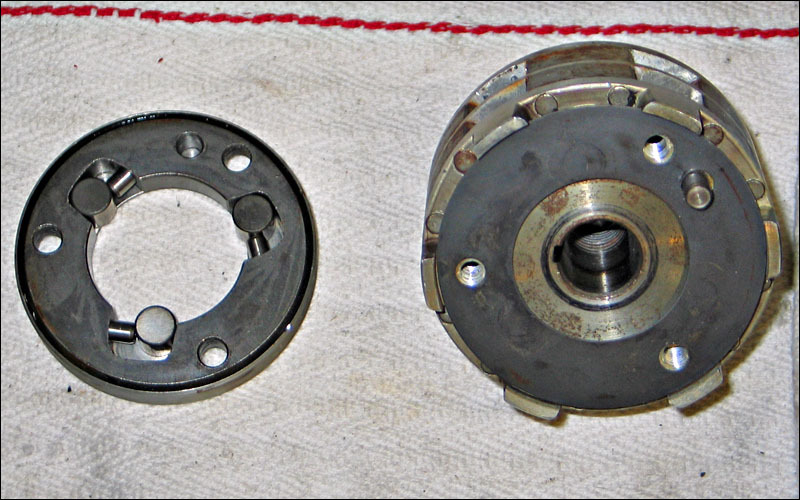 And to show people exactly what is inside the starter clutch. I have a couple extra parts laying around in this photo but you can see that there is a HUGE potential to lose parts when you take this assembly apart. Don't lose anything cause you ain't going to find any of it at your local hardware store!!! Here is a pic of the spankin new starter assembly as I was ready to put them in. I've been waiting to put these parts back in for over 10 years!! Don't let those rollers fall out when you are sliding it onto the crank... go slow and easy. Don't kid yourself - remove the magneto ring and pull it back so you have a clear shot of the crank so you can carefully place the magneto on. The shaft used a crescent shaped key to index it and it is HELL to put back on! Why didn't they use a straight key? If only things were so easy. The crescent shaped key need to be put at the perfect angle to allow the key slot in the magneto to glide right over it. 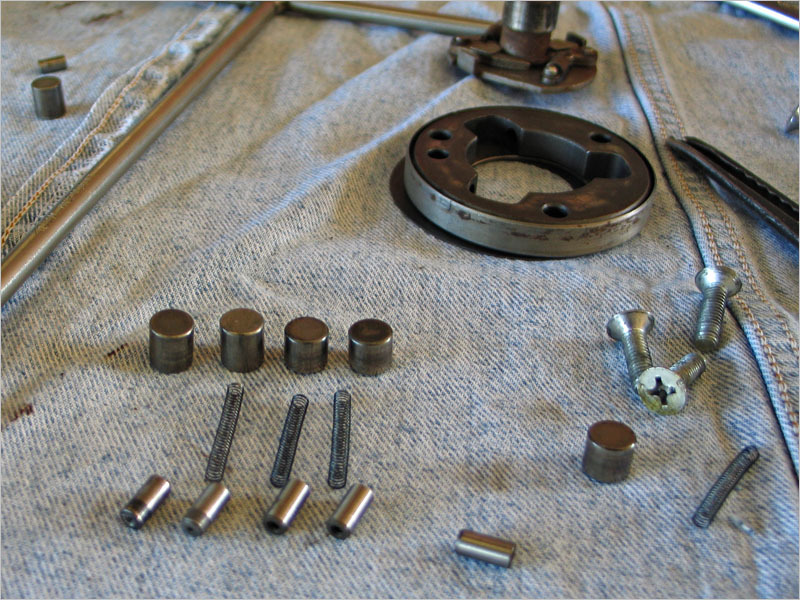 The parts have sharp edges so if its not aligned perfectly it just pushes the key out of the crank. It's very annoying but has to be done! If the ring around the magneto is left on the bike the magneto will try and stick to it magnetically and then you will never ever be able to align it perfectly for it to fit so don't waste your time. It will drive you to alcoholism for sure. Now go easy on that starter button!! I'm going to make extra sure that the points are in top shape and adjusted perfectly so that I don't have to crank the engine anymore than I have to.